When it comes to great traditions, taking tea in the morning, afternoon or evening is a favourite. 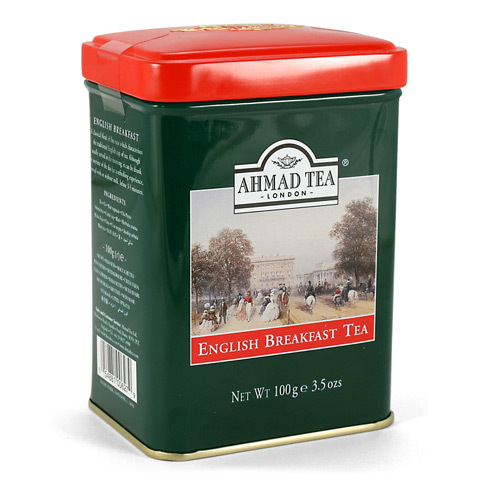 So if you want to enjoy a cuppa with a touch of British charm, why not put on a pot of Ahmad Tea? The folks at Ahmad Tea take only the finest teas from all around the world and blend them to bring you a rich taste and truly delicate aroma. Their Loose Leaf English Breakfast Tea is made from carefully selected tea varieties, blended to form a true British classic. It’s rich and flavoursome and perfect with scones and cream! Whether you enjoy a pick-me-up in the morning, a calming cuppa in the afternoon or a relaxing tea at night, Ahmad Tea is the tea for you. Contains a blend of Ceylon and other origin teas. Loose leaf tea, ideal for brewing in the pot. Beautifully presented in a green Ahmad Tea tin with a painted scene on the front. Variety: English Breakfast Tea (Loose Leaf).